The Yellow Dress – For the Women’s Tour?! Le Tour on the big screen, friends and barbecue. What more could you ask for? The climax to the 100th Tour de France would end for the pros in Parisian twilight. 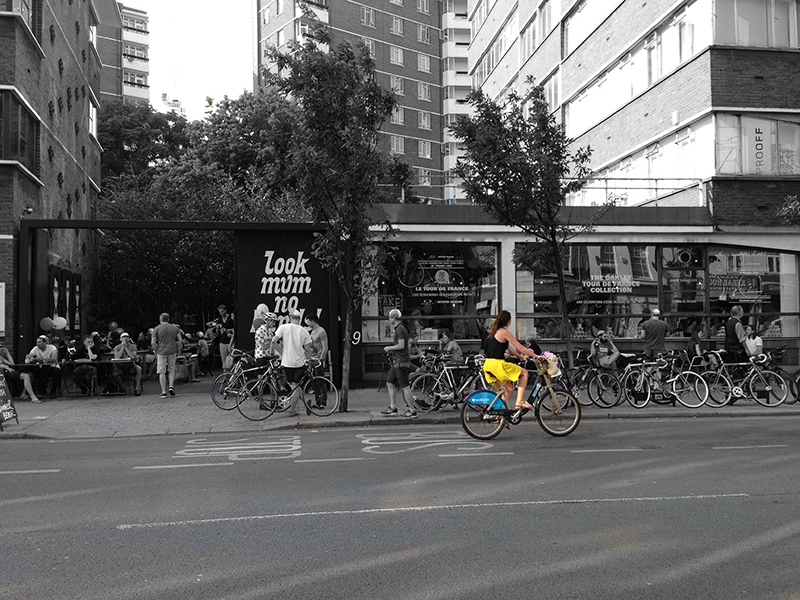 As for us, it is to be a celebration at London’s ‘Look Mum No Hands’ cycling cafe. We almost, almost, almost get side tracked with the hip-tastic White Cross Street Party, which just happens to be kicking off the very same night: 21 July 2013. Funky art, groovy street music, and lashings of good food. Both Notting Hill Carnival and the 100th Tour have competition on their hands. All the same, we make a break for it because we love this Race. Fans are out in force! Rather than be stuck at home, the Baroudeurs make the journey to soak up the atmosphere and cheer Froome-Dog on. Can Cav do it? Of course he can! Erm, well just not tonight. Ah well, there’s still much to shout about: A double win for GB by way of Chris Froome and his talented team of riders, and of course the young man from Columbia, Nairo Quintana (updated bio), standing on the podium no less than three times. May there be many more to come! The Yellow Dress – For the Women's Tour?! Wham Bam, it's the FAM!